The gray Oslo 25 Shoulder Bag from Vanguard is designed to hold and protect a DSLR with attached lens, 3 to 4 extra lenses, flash, 8" tablet, and accessories. The bag features a zippered main compartment with 2 removable, padded dividers for organizing equipment, and a slip-in pocket for storing a tablet. 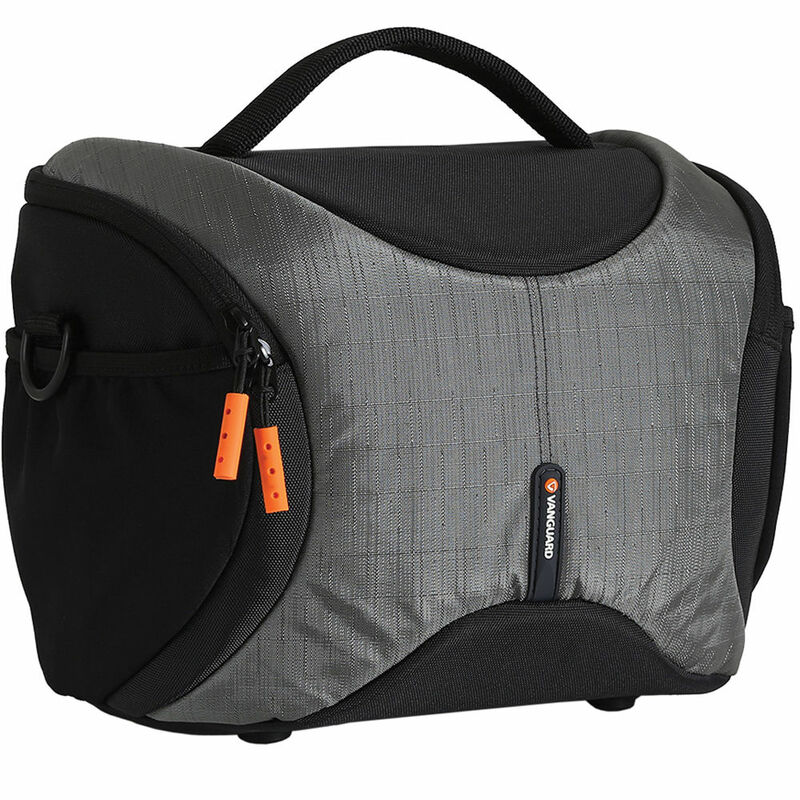 Underneath the bag's lid is a zippered pocket for smaller accessories such as memory cards, lens caps, and batteries. Box Dimensions (LxWxH) 11.0 x 9.0 x 8.0"
Oslo 25 Shoulder Bag (Gray) is rated 4.4 out of 5 by 9. Rated 4 out of 5 by Benjamin from Versatile case for mirrorless or fixed-lense camera I use this with my Sony RX10m4. It fits the camera (medium body with a fixed lens) with the hood reversed and a bulky strap installed, and cradles it well. The sides compartments easily fit my flash, filter case, extra batteries and charging accessories, and cleaning kit. There is ample room for a small tablet, cell phone, etc. The padding looks like it will provide excellent protection from drops and tumbles, or jostling about in a duffel or backpack for travel. Its a bit bulky for carrying around for casual outings or hiking, but will be a great way to store/protect necessary gear for travel or a long day out, and the included rain cover is a bonus. Rated 4 out of 5 by anthony.tella from great bag, especially for the price. Overall, yes I would recommend to a friend. Its a fantastic little bag. Its water resistant, also comes with a rain cover nicely tucked away in the back, it can hold my 2-3 cards an extra lens or two ( I usually have a 50mm, 40mm, or 35mm tucked away, no room for telephotos) extra batterys, lens caps, polarizers, lens cleaner, and a few other little things I don't feel like keeping in my pocket that day. Its not to intrusive, its small and low key, which is GREAT when you want to just blend into ur surroundings, the foam is holding its shape( slightly shifting to the left but no big deal), after every day beatings and holding a 5dmkiii thats pretty amazing. Ive used it in the rain with absoultley no problems, its comfortable, its a great bag what more could you really ask for out of a bag. the only con I have about the bag are the zippers, they are small and kinda feel cheaply made to me. I do keep this in the back of my mind when handling the bad I feel like if your ripping it open day after day they will eventually break. With that said mines are still holding up flike the day I bought it. Rated 5 out of 5 by SC from Great Camera Bag for a Day Trip This bag has become the one I reach for every time I leave the house with my basic gear. It is roomy without being too bulky. There is room for my Canon 60D, with a 24-105mm attached, flash and 50mm lens. My 7 Kindle Fire fits with ease even with the previously mentioned items. And, there is still room in the bag for extra cards, batteries, and other small accessories. I like how the non-slip strap is very comfortable especially when slung cross body. I also like that it looks more like a lunch bag than a camera bag due to its shape. Another likeable point is the padding which really protects the camera. I have dropped it about 12 with my gear inside and everything was okay. The case also opens on the body side so the wearer is the first to see what is in the case before anyone else. The only drawback I found was my 16oz water bottle, with its 3 diameter, doesn't fit comfortably in the pocket on the side of the bag, so I have to carry it separately. The pocket is too shallow and it tends to fall out. Note: The Canon 60D with 24-105mm lens is a snug fit with the back of the camera pointing up. Do not think a larger camera with the same lens would fit. Rated 5 out of 5 by Emgeesea from Excellent bag - Sturdy and plenty of room! I use these bags to carry telescope eyepieces and accessories for astronomical observing. I have 3 of them, and they work great - very well padded and with easily adjustable dividers for different size eyepieces. Rated 3 out of 5 by Anonymous from a sturdy little bag. the good: light weight/sturdy. things to be improved: attach rain bonnet to bag zipper was a little clumsy to fully close on the go. pockets could be a little larger for my taste. Rated 5 out of 5 by Anonymous from Great bag Great bag, just the right sized for me. The sales lady I worked with at B & H was really great in helping me pick out the right bag for me. Rated 4 out of 5 by Durango from Nice Comfortable, just the right size bag. It fits all my needs. The only flow is there are no straps for the tripods.